We try to hold a family meeting on the weekend as often as we can. I’ve covered topics such as listening skills, attitudes of winners and losers, peacemaking skills, and conversational skills for my 8 and 10-year-old daughters. Their favorite part to-date has been role-playing bad listening skills with us – they’re experts! Their second favorite thing is watching inspiring videos so I thought I would keep a collection of them here. Suggestions for new ones always welcome! Having spent the last five years saving my health and company, it’s time to save my marriage. Most entrepreneurs will understand what that means without explanation. It’s painful and embarrassing to admit this but here it is — I can’t remember taking one full day of vacation during the last five years. How that happened to someone like me who loves the outdoors, stuff like fly-fishing, hiking, running, camping, surfing, paragliding, hang gliding, etc is a long story. The short version is that we just rolled from one crisis to the next. Chronic health issues became a full-blown health crisis, and we moved to Colorado as the recession and changing dynamics of the job board industry crippled our company. During this entire time we were pivoting the company aggressively, nurturing our start-up job-search engine network, JustJobs.com. Looking back, it seems a bit insane, like grabbing an angry tiger by the tail while bleeding from the first try. So why do it? First and maybe foremost, I dreamed of being the best in the world at something when I was 12 years old. That became an enduring obsession with LatPro that I can’t and don’t want to shake. Somewhere around 2004, I realized LatPro.com wasn’t very scaleable and so I began looking for something better. Late in 2005 I settled on a new model and we were back in the start-up phase again. Secondly, my back was up against the wall. I fell ill to the point that I felt certain I couldn’t work a traditional job. Working from home and running my own show allowed me to incorporate the therapy I needed into my daily life. So turning the company around seemed to me the perfect solution to a world of problems. Trying to work our way out of a hole like that – sick business and poor physical health – was risky and the pressures on my family were intense but I saw no other practical option. The course we chose has been especially complicated by the large scope of our start-up — it should have had $2 to $7 million in capital. But the $1.3 million we raised in 2000 weighed heavily on me over the years. We spent the money inefficiently and I suffered knowing that my company was a disappointment to our Angel investor. So I was determined to bootstrap JustJobs.com. Today, the economy is recovering and our start-up is blossoming — it feels like we are finally going to ride the tiger we caught by the tail. ah, you know me… you’re qualified to give me a little advice! …love the short powerful phrases as if you were speaking to a child; “…this is bad for you”. Brilliant in its simplicity and truth. Reminds me of the other paradoxes I’ve experienced in business. Hire someone quickly, and chances are you mire yourself and your company in the mud. Simple and true, but until I felt deep pain, I couldn’t live by this simple good advice. feels like you’ve been eavesdropping on Carolina and me. I hear you saying “Heeelloooo Eric!”. Of course I knew this has been a problem for us, but somehow seeing it in print, sharpens it. Now, the question is… what am I going to do about it? Reading Brad’s book and blog, I realized he’s done all the things I fantasized about. Successful serial entrepreneur, Angel investor, mentor, author. Those are still reasonable possibilities for me. But it’s too late for me to make it look easy, way too late. We’ve struggled and I’ve made so many mistakes over the past 14 years with my company, they would fill a book like Brad’s. Now, I ordered do more faster in spite of a few reviews on Amazon which call it more appropriate for early-stage entrepreneurs. And, it was a great read – I tore through the book, just eating up the examples and anecdotes. It walked me through my career step-by-step re-living the mistakes I made, helping me categorize them and sometimes seeing them in a slightly new light. It reminded me that I’ve often thought of writing in more depth about the mistakes I’ve made. Hire friends – We hired friends for speed and convenience. As a new entrepreneur with no management experience, I was looking for a team at the height of the .com boom. I didn’t know how to hire so bringing in friends looked good, a case of going with ‘the devil you know’. In reality you don’t really know how your friends will perform under stress in new and difficult situations. If they don’t outperform, you have a tremendous problem on your hands. My advice – instead of hiring friends, learn how to hire. Failed to solve a critical business model problem – We were riding several different waves and our business was growing. But I could see one structural flaw in our business which nagged at me. I knew dealing with this flaw could be postponed. We had so many other problems that were more solvable and I focused on those first. What I didn’t take into consideration is that my company’s ability to change gears would decline as it grew in the wrong direction. My advice – face the music early and solve the impossible problem first. The impossible problems are solvable. Allowed our business to grow in nonscalable ways – I was so hungry for growth that I turned a blind eye to unwanted complexity. The costs were less immediate than the revenue growth and this was very seductive. We added human touch to improve quality but sacrificed scalability. We developed very costly features used by a tiny minority of customers out of fear. My advice – never lose sight of the holy Grail, a business that sounds like a jet engine revving as it grows instead of sputtering and coughing like an old biplane. Say no to “opportunity” often. Failed to find mentors when I needed them most – when I most needed guidance I was too busy digging my hole to go out and find the mentors I needed. Just before the .com crash we formed an advisory board but it did not include any Internet entrepreneurs. I operated in a vacuum of critical knowledge and spent years learning the basics of running a business when I should have been tinkering with the business model instead. My advice – find a co-founder and mentors who’ve already done all the things you need to do. Do it early. All right, this is fun and interesting and I have a long list, but I’m taking the day off to take the family for a trail ride in Estes Park where we’ll spend the night at a bed and breakfast! Later when I get some free time, I’ll move these mistakes to a new post..
A solution for everything (or almost). My feet are far healthier than before and I’m reminded that there’s a solution for almost anything. The trick is to keep looking. To extend my ‘barefoot’ season, I’m using the five finger with injinji socks and appreciating them mightily. I was worried about how to keep my pads up during the winter and came up with the rock mat. Just gravel thrown on a rubber door mat (the kind with the little rubber bumps holds the rocks in place) on which I jog 10 or 15 minutes once a week. I also use a lot of lanolin (sheep’s grease) to keep my pads from drying out. Don’t think anything else would do the trick here in Colorado. I mostly hike the hogback loop trail and the paraglider launch trail in North Boulder. Did really enjoy the golden arch trail which I hiked with friends and would love to go back to with my family! I love to teach. As obsessed as I’ve been with learning business for the past 14 years, it’s only natural that I like teaching my kids what I’ve learned. My girls are 8 and 10 years old so I love to find materials that really engage them. Much of the time, the things we talk about are as much about life as they are about business. For example, we recently read Jeff Bezos’ deeply moving graduation speech at Princeton. Nothing fires me up like watching them absorb the morals in a story like this. The story is about a boy who lost his parents on the day he was born. That stormy night didn’t only take the life of his parents but his country, fictional Katoren, lost his beloved king too. The boy gets raised by his warm-harted uncle, who works hard to provide a happy life for the boy. In the meantime Katoren is governed by the late king’s cabinet members, for the king died without an offspring. Not wanting to give up the new-found power, these head-to-toe politicans keep postponing the day to appoint a new king. Our hero is already 17 years-old. He decides he would go up to the ministers and ask them How To Become a King of the country. The ministers plan to dismiss him but the boy arrives with the press to the meeting. The cabinet is forced to make up a way to statisfy the press but they try to make sure that the boy wouldn’t be king. They tell him he will have to do 7 tasks. He would have to fight dragons and gnoms and misteriously swelling noses. How will he get to the towns in need? By train of course. So the adventure begins. We had some great discussions about the hero Stark and they tied in beautifully with previous lessons about basic and advanced listening skills. It was very satisfying to see my girls understanding the concepts and the often clever language in the book. Highly recommended! What would you suggest for teaching kids about life or business in engaging or fun ways? On the second day of the Four Mile Canyon fire, we knew that a good number of homes in my parents neighborhood had already burned. On the third day, I found a satellite image showing their home had not been burned. I was overcome with relief after days of tension. 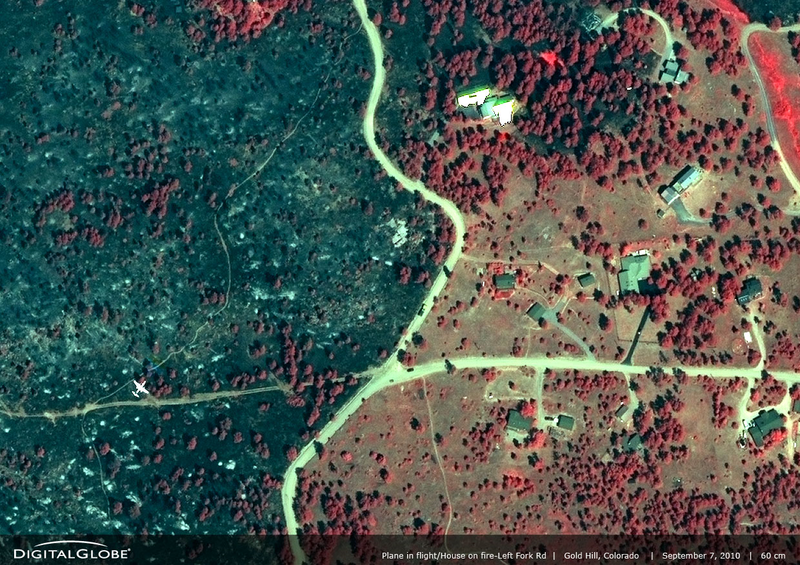 But a few hours later a close up of the same satellite image appeared with a caption at the bottom saying ‘Plane in flight/House on fire – Left Fork Rd.‘ and it clearly referred to my parents home. When you look at these images, red is good – unburned, and dark green is bad – burnt. See the white home? See the plane at the bottom left? That caption underneath really frightened us, it was so official looking… we thought we were looking at the flames consuming the house. But after staring at it for about 10 minutes, I eventually saw so many inconsistencies (no smoke, perfect roof lines, the plane is white also, etc) that I decided it was a mistake. My parents home is the only one around with a metal roof. So, we think that the reflection from the roof and windows was so intense that it overloaded the sensors on the camera. The next night, we were advised to prepare our own property in North Boulder and be ready to evacuate. We took it seriously as our house is roughly at the mouth of the canyon and the winds regularly blast out with gusts of 40 to 50 miles an hour. The city ran a big tractor cutting grass at the edge of the open space while the helitankers passed directly over my house just 100 feet in the air every four minutes or so. It felt like a war zone and we scrambled to get ready. Fortunately the firefighters (over 1,000 of them from all around the country by the end) did such a phenomenal job, no more houses burned and the fire didn’t spread. The fire could have entered some very large and extremely flammable mountain neighborhoods on Friday night. My parents were allowed in to their neighborhood on Sunday and saw that the fire burned right up to the door and stopped. Actually it burned around three sides of the house and left the fourth untouched, leaving flowers blooming brightly without a care in the world. The fire chief says the team was about to spray foam on the house to protect it when the fire suddenly jumped the road and raced towards the house causing the fire fighters to retreat in a hurry. Apparently the mitigation work my father did during the last 10 years did the job. This includes thinning trees, removing lower tree limbs, mowing the grass when it gets tall, and applying fire retardant paint. A neighbor who did lose his home commented, “This isn’t the worst thing that’s happened in my life”. And we know he’s right – he entered a concentration camp when he was 13 and came out at 17. Yesterday, a wildfire started outside Boulder a couple miles due west from my home. In the morning we saw wisps of smoke coming over the ridge behind our house and expected to see flames. There was no information on the TV or radio so we went to twitter search and discovered the fire was not on our ridge. I watched on twitter as a few other curious folks asked about the smoke. The twitter traffic started to build and information began to flow in as the sky darkened. I stumbled onto a live feed for the Boulder County Sheriff and fire communications and tuned in. I started tweeting what I heard but quickly noticed ‘fishnette‘ doing the same — but she did it much better than I, so I quit. Trying to understand where the fire was burning was difficult but important to me because my parents home is (or was?) on Sugarloaf Mountain. So, I was simultaneously listening to the live feed, reading fishnette and searching Google maps for the road names referenced by the firefighters. Neither TV nor FM radio can compete at all with hearing firefighters in real-time scrambling to organize themselves, staging in one area, retreating, restaging in another, calling for resources. It’s probably the closest thing to warfare I’ll ever witness. I say thanks to everyone involved in fighting the fire. The calm professionalism I heard and continue to hear is awe-inspiring. Thanks for fighting this life-and-death battle for us. My deepest condolences for the loss of your homes. Am hoping we won’t have to evacuate today. Can hear the helicopters and aircraft overhead. Godspeed! I want to get into video but I’m not ready to appear in person yet. Fortunately, my cats are. So move over James Cameron, here’s my Avatar. I have to apologize in advance for the lack of violence and mating. Still, I expect millions of views. My video was cut short when the tape ended, but Milo and Leo’s cuddling turned into a great all out cat-fight. Seems to be an integral part of their friendship. I want to be useful, truly useful — but it took a crisis or two for me to figure that out. Two years ago I hit rock bottom. My health had been in decline for a number of years when I hit a crisis. I needed to be cared for and was virtually useless to my family and company. Often, it was all I could do to get from one hour to the next. I prayed to recover so that I could become useful again to my family, friends, colleagues and society. During the past two years, I’ve made remarkable progress, slowly but steadily returning to my old roles. A good marker for my return to health is my cholesterol level which has risen from a low of 99 two years ago to 146 today. In high school, it was measured at 150 which I suspect was too low (for me). So I will keep eating all the saturated fats that I can until I reach about 170. Someone pass me the chicken liver please. Rock bottom has a lot to offer. Reflecting back over a 10 year period of time, I can see that I was burning with ambition when I started LatPro. I wanted to achieve something big. I always liked to express my creativity, build things and make my own decisions, but I was also driven by visions of fame and wealth. I wanted to be perceived and remembered as being intelligent and competent. My parents would notice and remark on my success. My wealth would enable me to travel with my family on extended vacations sharing outdoor experiences like fishing, camping, biking and so on. I would start another company or two and become an angel investor or venture capitalist. Although the last two years has been the performance of a lifetime for us, my oldest and grandest visions haven’t materialized. My health crisis, the emergency move from Florida (where our office is still) led right into this great endless recession. In the end, a mighty performance just kept us going. Hitting rock bottom helped strip away the fluff from my vision and helped me prioritize what I want and work for. I saw clearly that I most wanted to be useful/helpful but couldn’t without good health. The two are tied together. If you think about the way sleep and health are related you can see even deeper connections. The more people you help, the stronger the foundation of your business & career. The more stable your career is the better you sleep and healthier you are. Somewhere along the way I also realized that being smart, successful, and wealthy might earn you more enemies than friends. And, if your parents aren’t interested in business or aren’t in the habit of paying compliments, no amount of success will change that. On the contrary, chasing success for its own sake is just a recipe for exploding your health and family. I’m still burning with ambition but it has a different flavor. Today, I’m just focused on providing useful services that move people forward in their careers, that cause them the to sit up and say, “Wow, that’s helpful, I can use that!” Furthermore, I’m committed to doing this without leaving my family or my health behind. And well, the good news from above rock-bottom is this — every day we get more useful, help more people and I sleep a little better. That’s a dream come true! I’m focused, driven, and persistent. I get so focused, I sometimes run out of the house wearing the same color from shoes to cap… I notice but am not easily distracted! Sometimes, I get a haircut a month or more after I need one. The typical entrepreneur maybe? A friend graciously used the word "passionate". So guess what… all that makes me prone to making mistakes — particularly under pressure and moving too fast. When you are trying to make something happen, there is always a certain amount of horsetrading involved. Unfortunately, my natural talents don’t include diplomacy — the right words just don’t come naturally to me. In fact, even in the best of times, I rub many people the wrong way. I’ve lost partners for this reason. I also lost a friend once. The fact is, I make mistakes. "Eric, I might have considered something more but for your curt response." "My Mother would call that just plain rude.."
The good news is, that I am ferocious about learning of all kinds and especially from mistakes. The irony of these two particular incidents is that they resulted from misguided attempts to compensate for previous mistakes! In other words, I learned an important lesson that caused me to make these two mistakes. I got halfway to learning the proper lesson but halfway was not enough. Because these two ‘feedbacks’ came so close together, a lightbulb went off in my head and I finally closed the loop on this lesson eight years later. I try to live my life according to a code or manifesto assembled from all the mistakes I’ve made and lessons I’ve learned. They say feedback is a gift, and I truly value being called out when it is earned. That is how I update my code and evolve as a person. So, thank you for speaking your mind, friends. It helps me improve mine every once in a while and saves relationships that deserve saving! Curious about what I learned? Well, I habitually process disappointment in unhealthy or unproductive ways – the roots are in my childhood of course, but I won’t bore you with that. The bottom line is, with small disappointments it’s enough to understand the dynamic to avoid taking the low road. When they are big, it’s important for me to let the disappointment flow in a healthy way instead of storing it up for later. Because, when later comes around, that’s when the big mistakes fly! We are constantly blasted by negative messages today and if you run a business or if you’ve been laid off or had your salary cut, you’re experiencing changes that confirm the talk. It’s hard to hide it from a new employer if you have been laid off from your prior role. However, it’s up to you whether or not you come across as negative about the layoff, or as someone who has realistically absorbed the event and is moving forward. So, how exactly do we absorb the negative events and move beyond them? First, recognize that anxiety is valuable. Stop running from it. Accept it into your life and embrace it. Really. Don’t just pay lip service. Take some time out for this. There is a message for you underneath – your anxiety wants something. Some action is required on your part to address the unmet needs driving your anxiety. Don’t assume that your needs are the obvious ones. It’s not just money that you need. That’s an oversimplification that won’t get you anywhere. Maybe your most pressing need is not getting a job – maybe it’s a radical lifestyle change your anxiety is asking for. Maybe cutting your expenses is more pressing than getting a job. In a quiet time and place, ask yourself about the roots of your anxiety – and then listen patiently. Accept your anxiety into your life now and embrace it. Go deep and hear its real message. It was very likely a conversation like this that led Leah Bird and her husband, Ed Wright, to trade their comfortable two-bedroom apartment in Beverly Hills, California, for life in a trailer on a five-acre Oregon farm. This is not to say that everyone that gets laid off should move to a farm – most likely your needs are not that extreme! The point is that your anxiety has something important to tell you about your life and your next move. When you listen to that message and you act on it, you should find the peace and positive energy that you need to jump back into the world offering your skills in place of your fear and frustration.